In the year of Sarnia’s 100th anniversary celebration a key heritage display is in dire need of repair. City officials say the enormous mural on the north-facing exterior wall of Grace Brothers Antiques will come down permanently if $20,000 can’t be found to fix it. 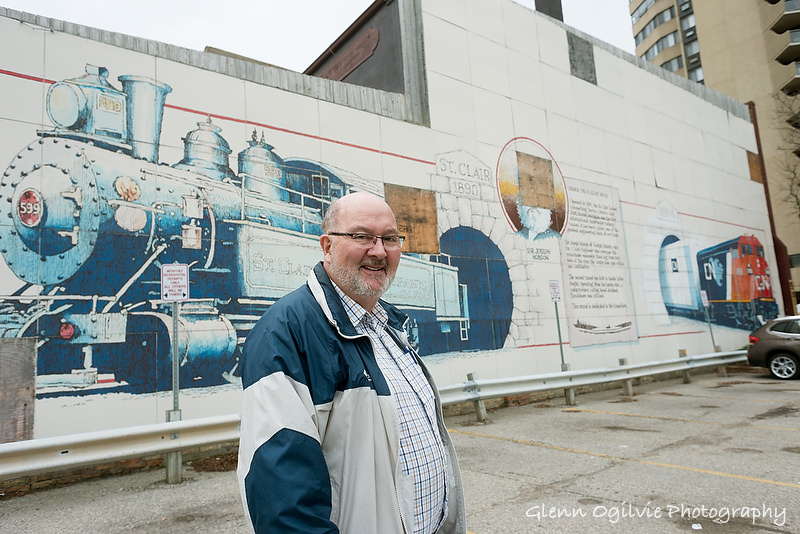 “From a community standpoint, it’s a real shame that wall doesn’t look good anymore,” says Wayne Wager, chairman of the Sarnia Heritage Committee. Installed in 1995 for $26,000, the artwork is a nod to the city’s railway tunnel history and depicts the original tunnel built under the St. Clair River in 1890, as well as the second one completed in 1994. Four of the 4-foot by 4-foot Fiberglas panels have fallen off and others look loose, says Max Williams, of the city’s planning department. The wall faces a municipal parking lot between Front and Christina streets and is visible when exiting the Imperial Theatre. “The parking authority has received complaints about the panels possibly falling on pedestrians or parked cars,” Williams said. Pressure treated wood behind each panel is rotting. Over the years, water got behind the mural through the screw holes used to attach the panels, explained Williams. But the mural is a dominant downtown feature, said Wager, and the heritage committee doesn’t want to lose it. It’s launching its first-ever fundraising effort to save it. The city is dismantling and storing the panels, while the heritage committee is determined to get it back up on a metal frame that will last. The mural is the work of Canadian artist Peter Sawatzky and the painting itself is in very good condition. Sawatzky used locomotive paint because it’s durable and complements the subject. Depicted along with the tunnels is a portrait of Sir Joseph Hobson, who engineered the first one. The B.I.A. was expected to maintain it but disbanded years ago. A second heritage mural of Port Sarnia was commissioned for the downtown in 1995 on the east side of Coffee Culture on Lochiel Street. It was painted directly onto the wall and shows no signs of deterioration. Anyone wishing to donate to the tunnels mural can contact Williams, who is secretary of the heritage committee at city hall (519-332-0330).